In June of 1946, President Harry Truman signed the National School Lunch Act. As part of the 70th anniversary of the signing, the Institute of Child Nutrition (ICN) has partnered with theTruman Library in Independence, MO. 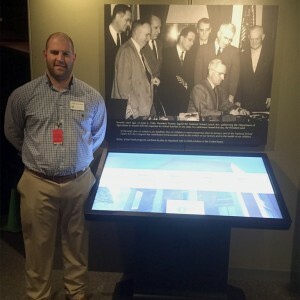 Thom Hunter Pratt, ICN Computer Technician with the ICN interactive multi-touch display at the Truman Library. ICN’s interactive multi-touch display, which normally is on display in the lobby of the institute, will be on loan to the library until Fall 2016. A few items featured on the kiosk are: a welcome video featuring ICN Acting Executive Director Aleshia Hall-Campbell; the 1948 color film The School That Learned to Eat; three vintage photograph collections of child feeding programs from the U.S. Department of Agriculture; three school lunch flipbooks; and a historical timeline charting the development of child nutrition programs in the United States from 1853 to present day. The kiosk also highlights videos of four past presidents of the School Nutrition Association – Shirley Watkins Bowden, Dorothy Caldwell, Josephine Martin, and Mary Nix, sharing their recollections from the early 1970s about how the needs for and the eventual creation of a national nutrition institute came about. The exhibit will open to the public April 2, 2016.